This praise for George Dureau (from art critic D. Eric Bookhardt in Gambit) distills what many thought of New Orleans’ son George Dureau into a poignant statement. A lifelong native of the city, George Dureau embodied the spirit of New Orleans in his life and his work in a way that few others can claim. He died on Monday morning April 7th at the age of 83. Born in 1930 at the beginning of the Great Depression, Dureau grew up in Mid-City near Bayou St. John. After graduating with a degree in fine arts from LSU in 1952, he began architectural studies at Tulane. His art style is characterized with a focus on the male form as a sinewy, powerful object of the eye. He had a predilection for fantastic mythical figures, as well as the many colorful characters of his native city. To get a glimpse of Dureau’s art, one need only walk through New Orleans, where his works are featured in numerous public spaces and museums. 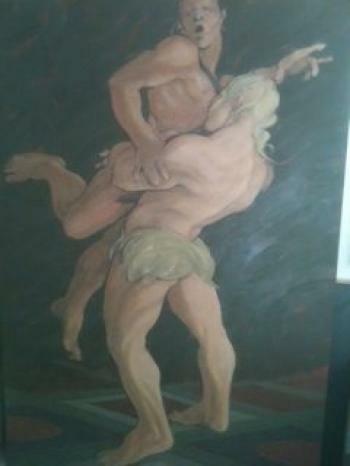 Those interested in owning a piece of New Orleans history will love Dureau’s oil painting Hercules and Anteaus. Available on consignment from Barnett Fine Art, this work features the mythical depiction of the male form for which Dureau was so well known. This entry was posted on Thursday, April 10th, 2014	at 9:31 pm	and is filed under Collectable Art	. Both comments and pings are currently closed.